100 LED Fairy Bubble Crystal Ball Lights Just $11.99! You are here: Home / Great Deals / Amazon Deals / 100 LED Fairy Bubble Crystal Ball Lights Just $11.99! You can get these 100 LED Fairy Bubble Crystal Ball Lights for just $11.99 right now! Just use code: UKDK9AWK at checkout to get them down to just $11.99! 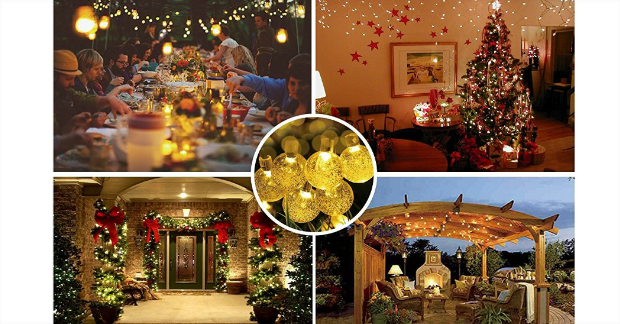 They are waterproof lights that would be perfect if you will be hosting a holiday party! You can also save 5% on 6 pack LED bulbs when you purchase 1 or more Qualifying items offered by Mulcolor. Just use code: CYA2PXGS at checkout.